I am so excited to be able to offer this giveaway! 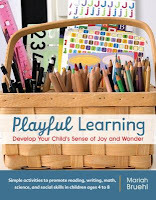 Since I'm participating in the Playful Learning Book Study over at Teaching My 3, I get to give away a 6 part e-course worth $125 for free!! 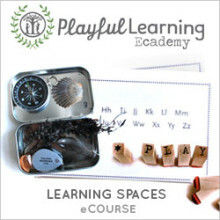 I enrolled in the Learning Spaces e-course. It's all about creating learning spaces for children. My classroom is going to rock this year! 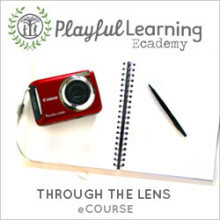 Through the Lens is all about photo journaling-- awesome for beginner or advanced bloggers. It was a hard choice! If you would like to be a part of this giveaway leave a comment below telling me which one you would choose. Make sure to leave your e-mail on your original comment so I can get in touch with you if you are the winner! #1-Leave your first comment telling me which you would choose. You can do all of them or some of them. Remember, the more chances the better! I'm going to run the giveaway until next Friday on July 6th! Don't forget that Tuesday is the Webinar at 8:00 Eastern time! It's free to anyone who has signed up at Teaching My 3.. just click and sign-up so you can join in on the fun and learning! Hey girl! 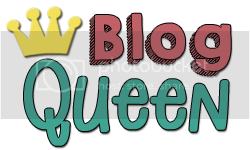 So glad to have found your blog- I'm going to be reading your past posts like a mad woman to prepare for my new class this year! I would LOVE to get in on that learning spaces- exactly what I need before I set up my first classroom! 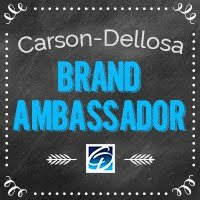 I am so glad I follow your blog so I can enter this wonderful contest! I looked at both especailly since I LOVE taking photos but I think my class would benifit from "Learning Spaces e-course". Thank you! I would love to attend the Learning Spaces ecourse!! I like/follow you on Facebook! 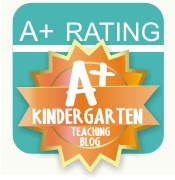 I would love to win the Learning Spaces Course. Thanks for the chance. I would love to learn more about how to create spaces for kids that engage them in learning so the Learning Spaces Course would be awesome!